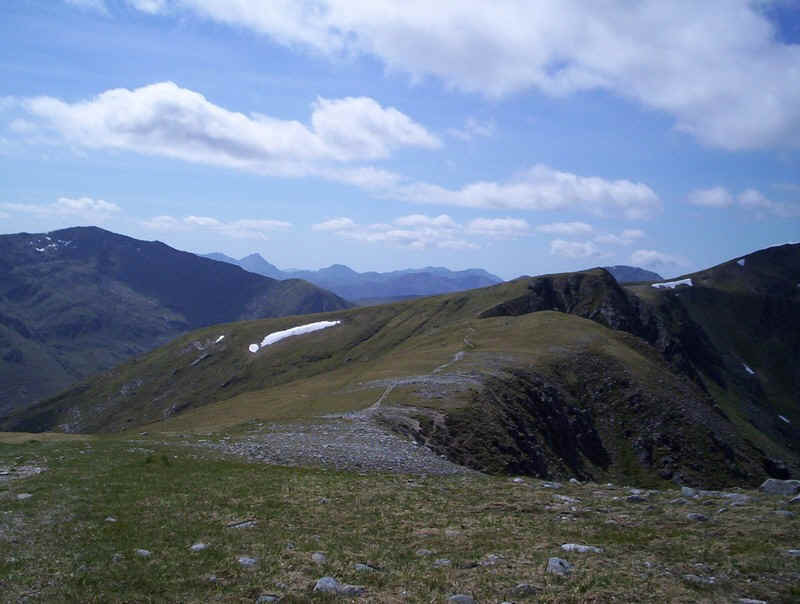 Following the previous day's walk to Ciste Dhubh and Aonach Meadhoin I was pleased that the weather forecast was for dry, sunny weather but markedly cooler. 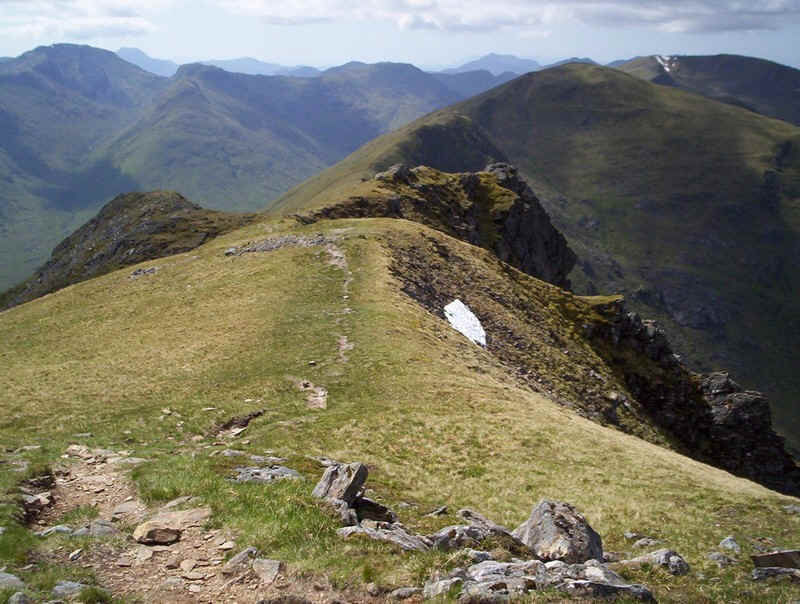 Whilst many walkers deal with the South Glen Shiel Ridge walk with its seven Munros I'd decided to split the walk in two, partly for logistical reasons of transport, and partly because I wanted to savour this great mountain walk. 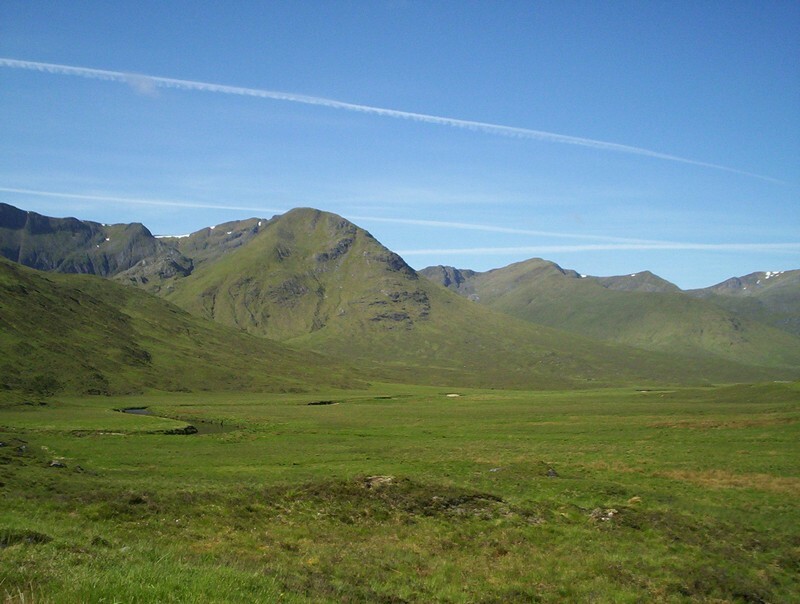 Why rush one of THE walks of Scotland? 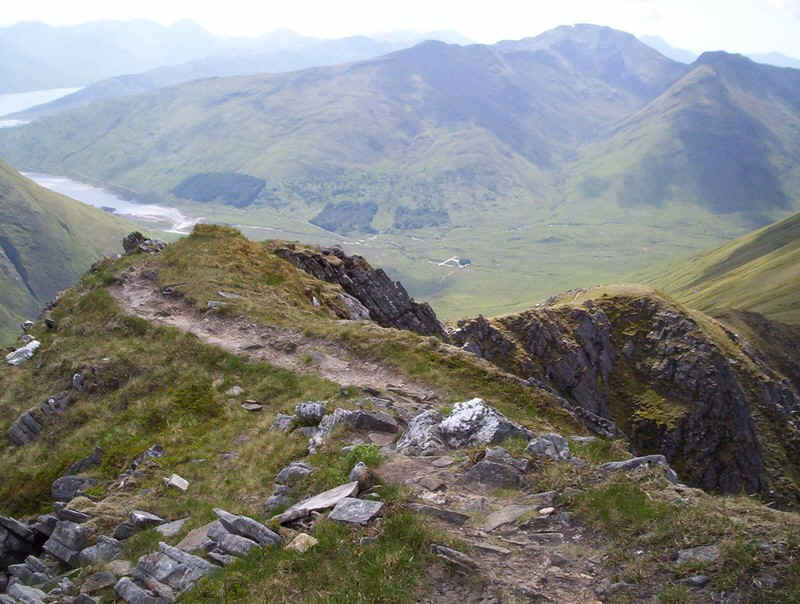 The plan was to walk from the Cluanir Inn over the four Munros of Creag a' Mhaim, Druim Shionnach, Aonach air Chrith and Maol Chinn-dearg and then drop down into the glen via the stalkers' path. 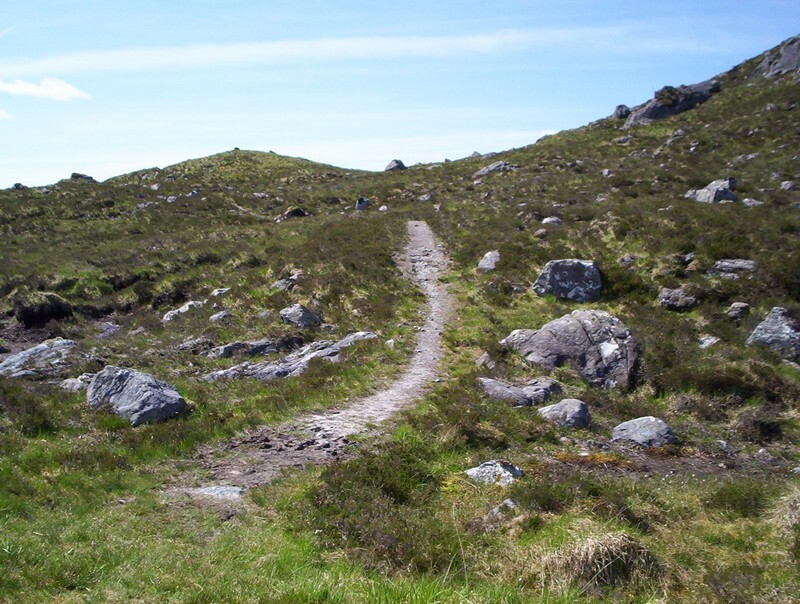 The walk starts along the old road to Tomdoun, that is now submerged by the waters of the Loch Loyne HEP reservoir. 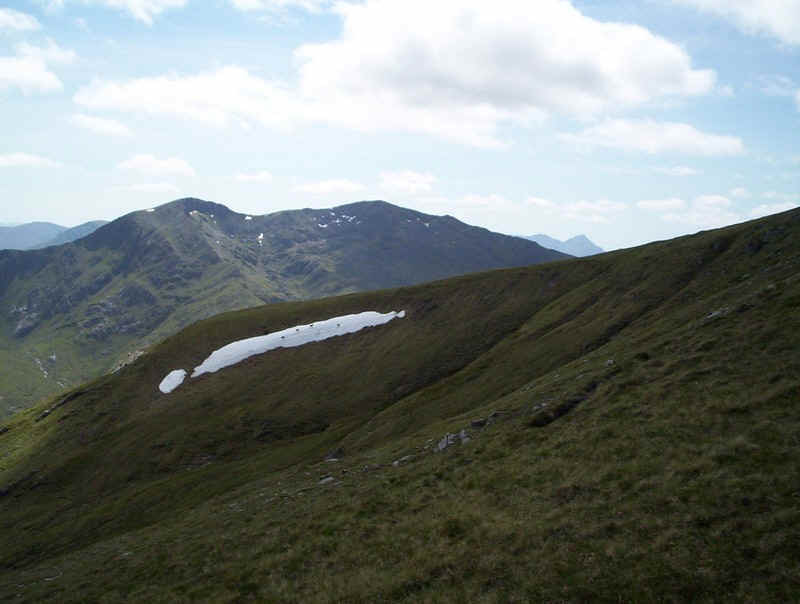 The first section provides access to the Cluanie Lodge but beyond there the road is closed. 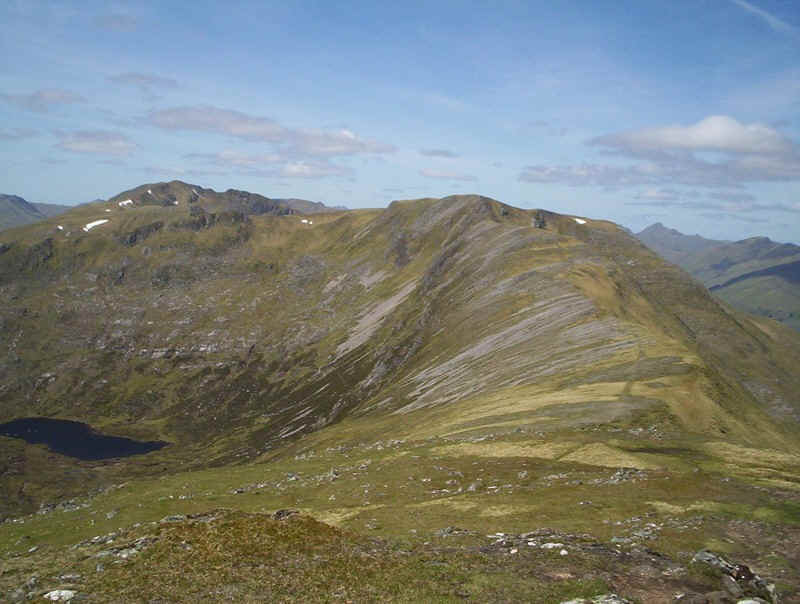 In the photo below the beginning of the ridge can be seen with Creag a' Mhaim prominent. If you right click and select "open in new window" you should be able to switch between the map and the walk description. 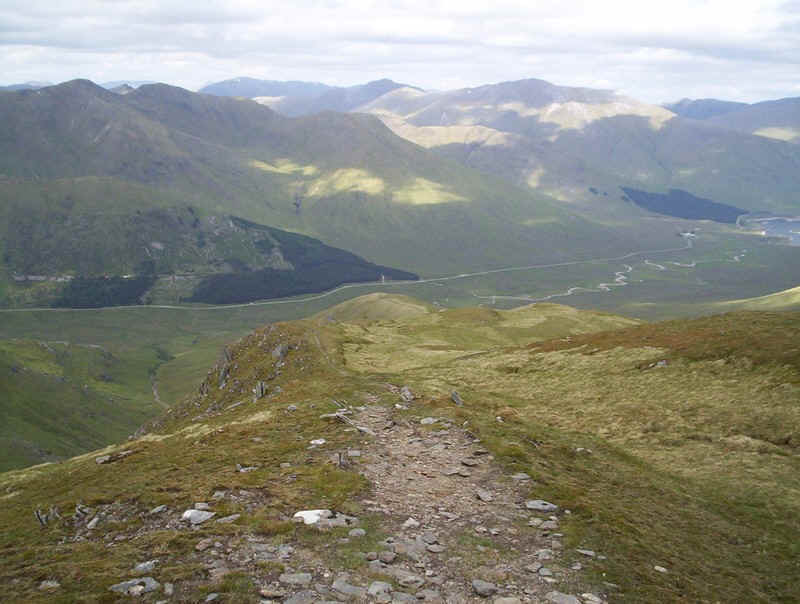 The old road winds around the foothills of the ridge and provides a good warm up for the start of the day as it climbs to about 400m. 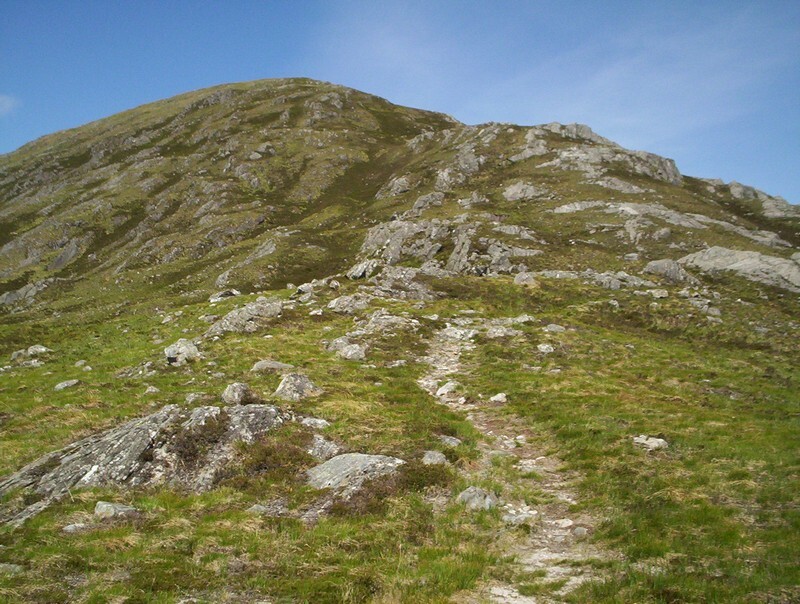 Just beyond the watershed between Loch Cluanie and Loch Loyne a stalkers' path leads off uphill. 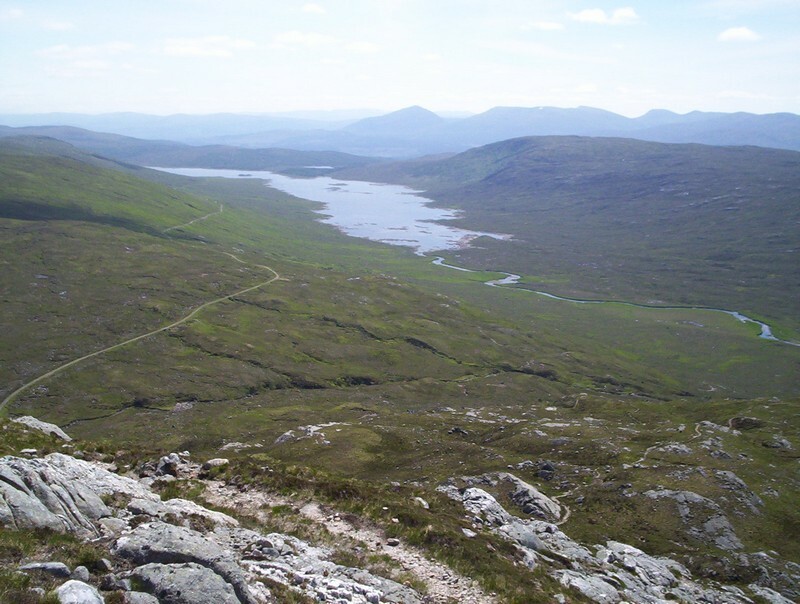 ...whilst behind is the extensive view over Loch Loyne with the old road heading into oblivion. 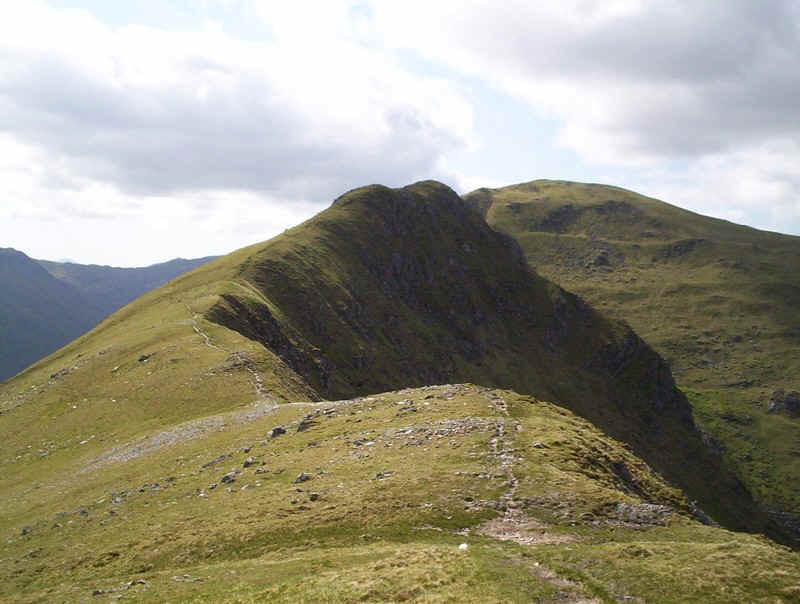 Creag a' Mhaim summit (947m) is in view. ...heading off along the ridge proper. I'd been dreaming of this walk for months and here I was with perfect weather; all was well with the world! 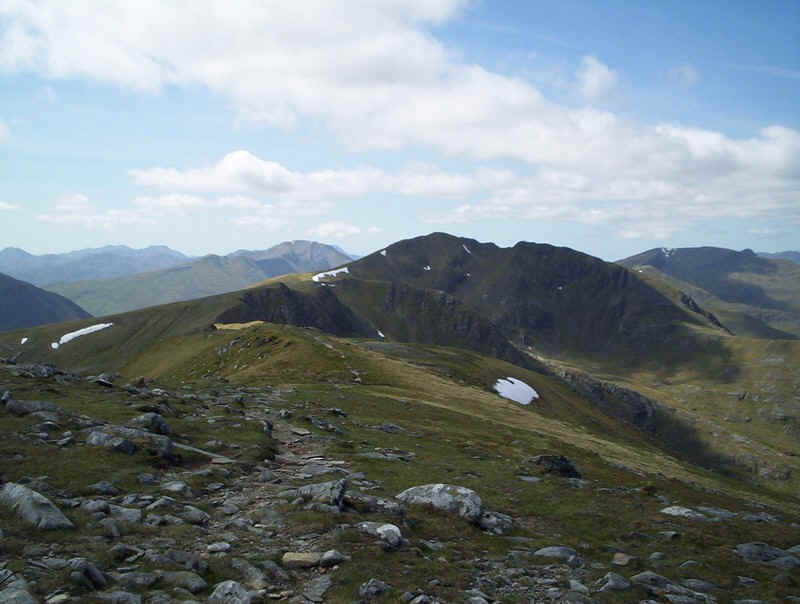 The next Munro Druim Shionnach lies lies ahead with the more challenging Aonach air Chrith in the left distance. 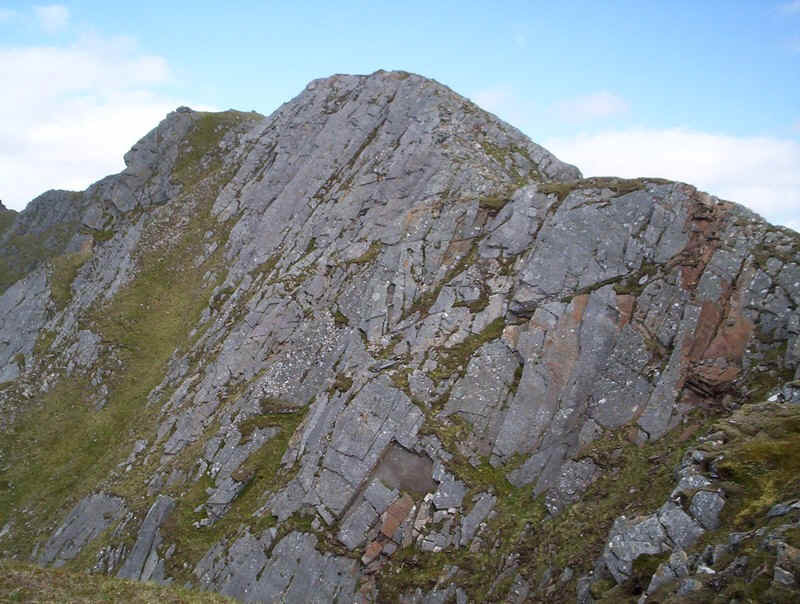 A thousand feet below is the lochain in Coire nah Leac. 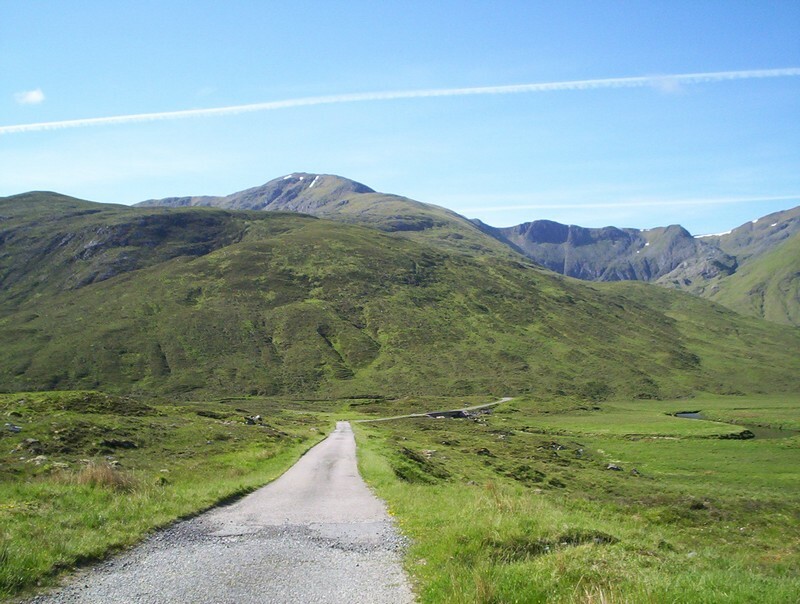 Across Glen Loyne are Spidean Mialach and Gleoraich. 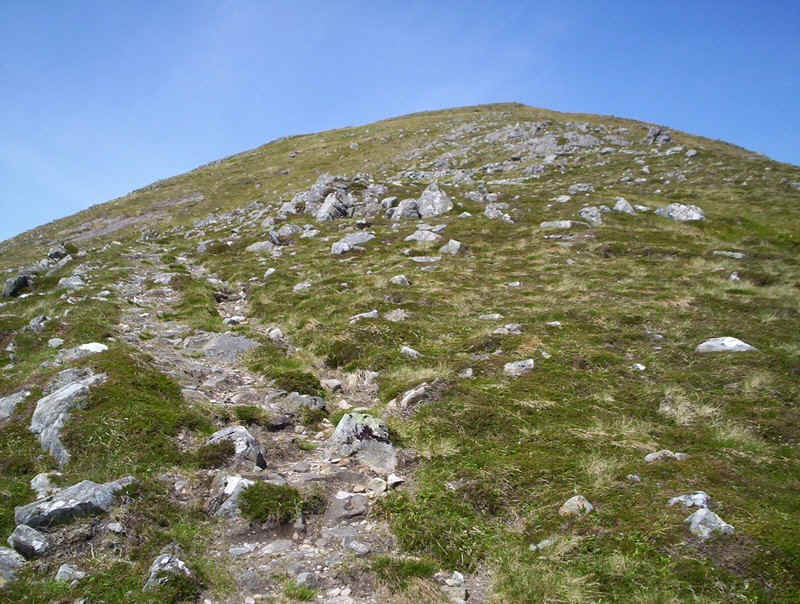 Apparently you can climb these in a longish day from Cluanie by following the old road and then stalkers' paths. 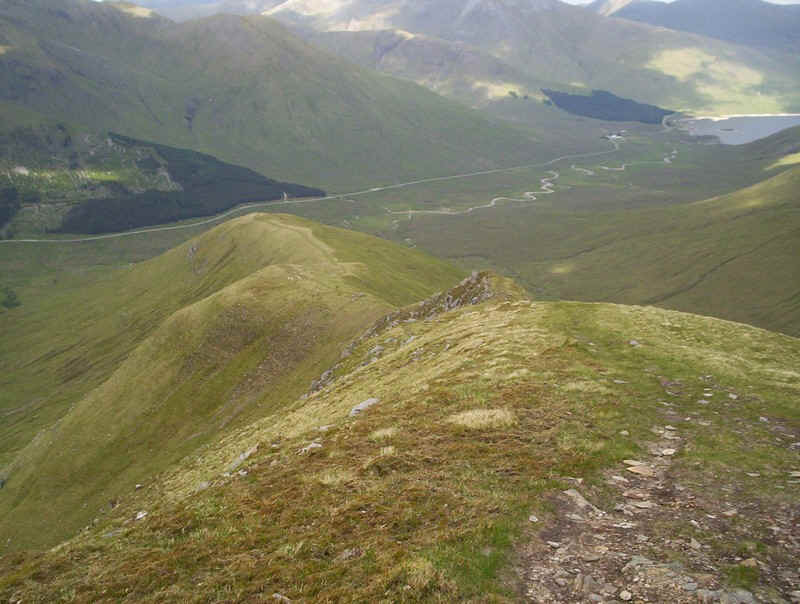 Dropping down from Creag a' Mhaim its craggy north east face becomes visible looking back uphill. 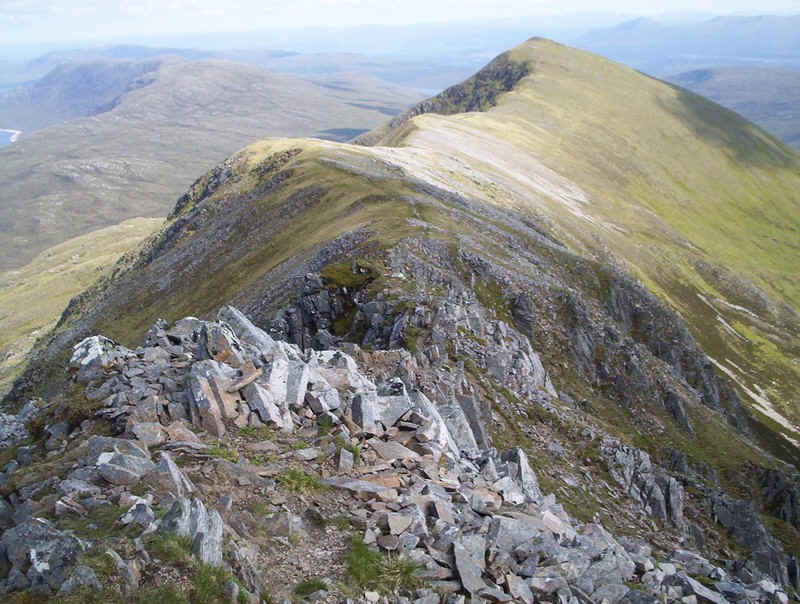 The bealach between Creag a' Mhaim and Druim Shionnach with some interesting looking rocky bits appearing. The ridge narrows considerably for a short while. 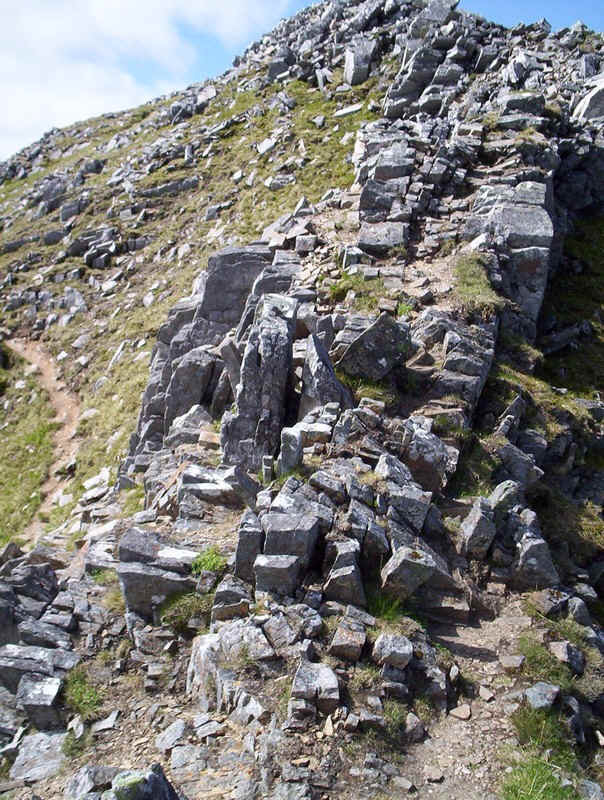 The adventurous will go right over the top but there is a slightly less exposed section to the left. 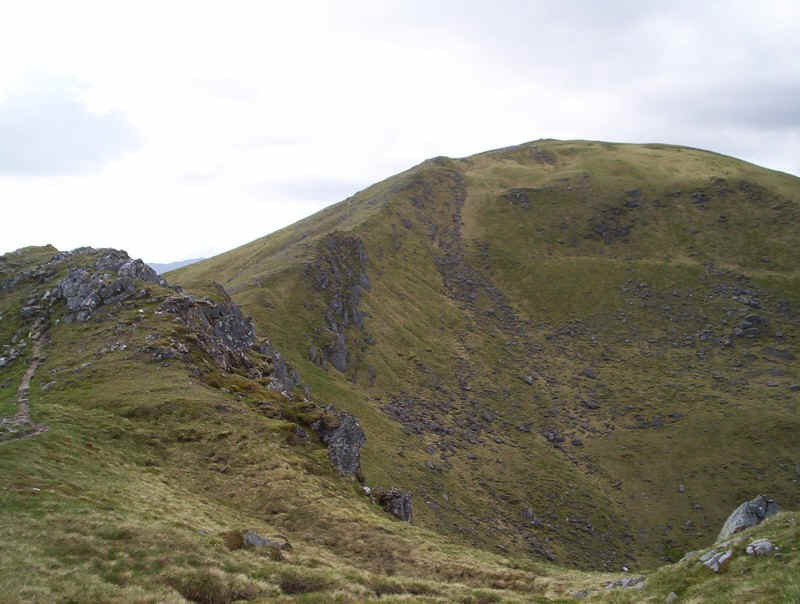 And looking back over the narrow section of the ridge. 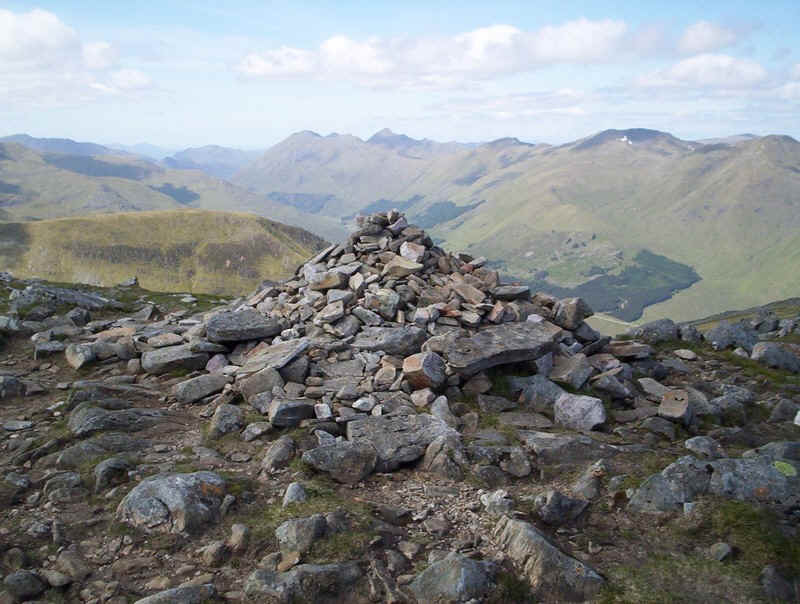 Druim Shionnach's summit cairn (987m) with the hills on the north side of Glenshiel and the Five Sisters further along. 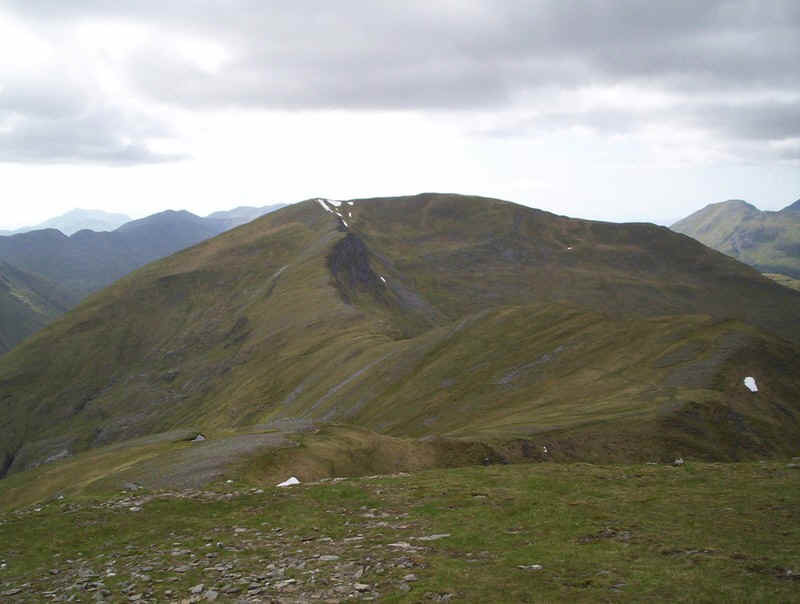 Onwards towards the highest point on the ridge, Aonach air Chrith (1021m). 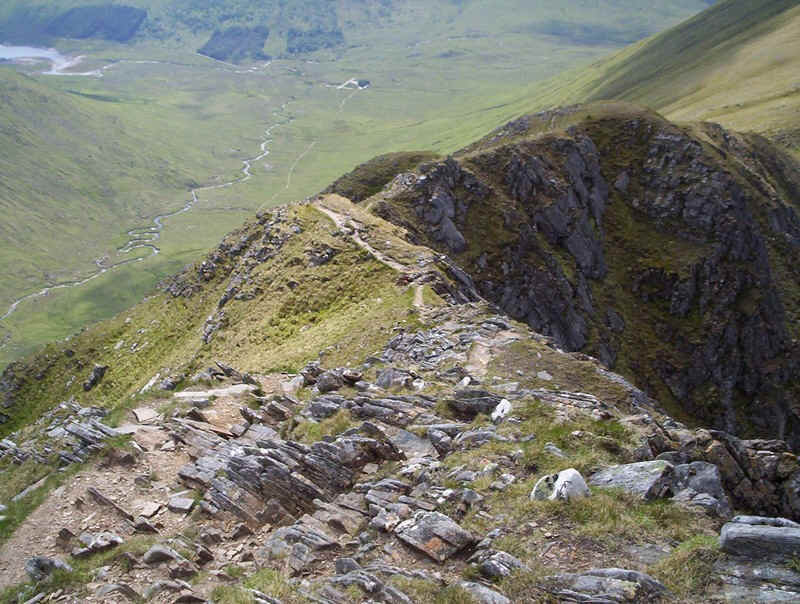 .....and meanders along the cliffs of Coire an t-Slugain . 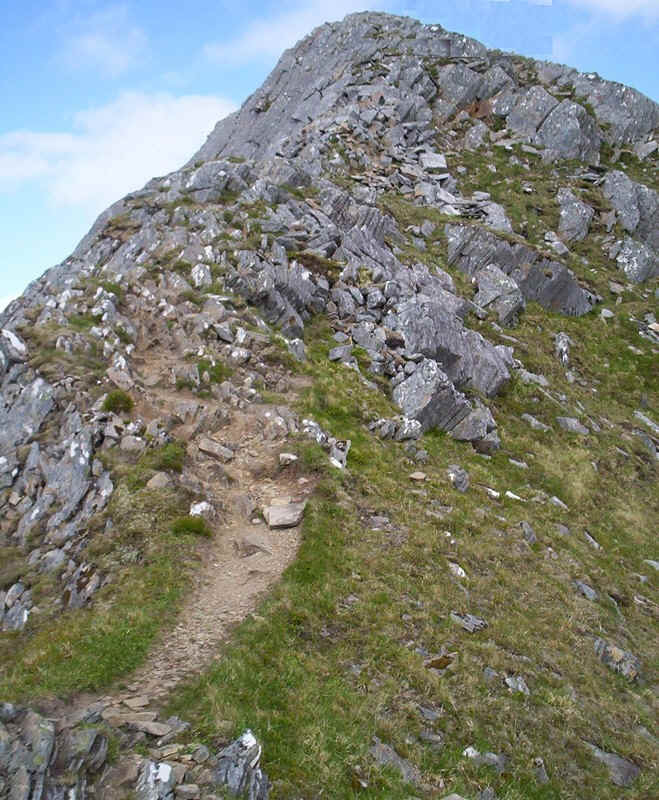 There's another easy climb before another slight descent. A large patch of snow was clearly attractive to a group of deer who appeared to be playing in it and licking the snow for its moisture. 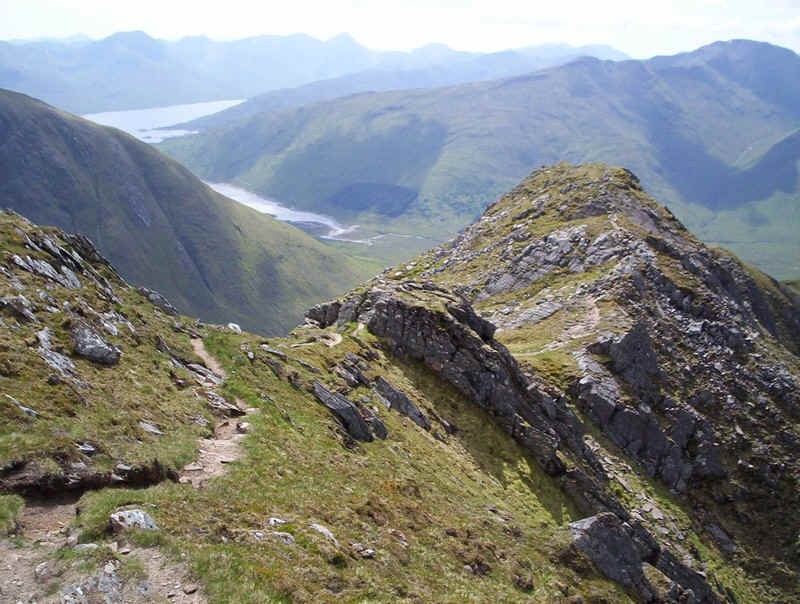 ....to Aonach air Chrith. 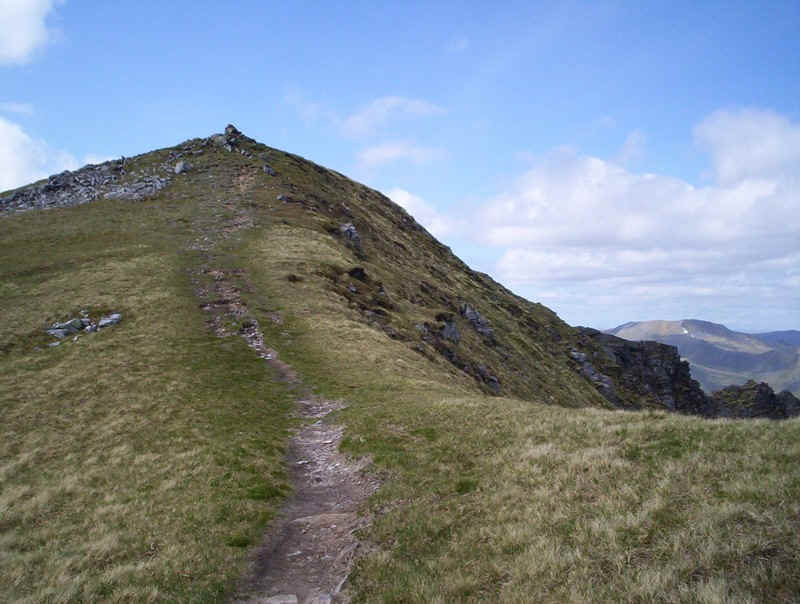 Now I'd heard that the descent from this hill was "interesting" and I was a touch apprehensive, given my dislike of big drops and exposure, as I approached the summit. Another glance back along the ridge. .......I hope that's not the way down! 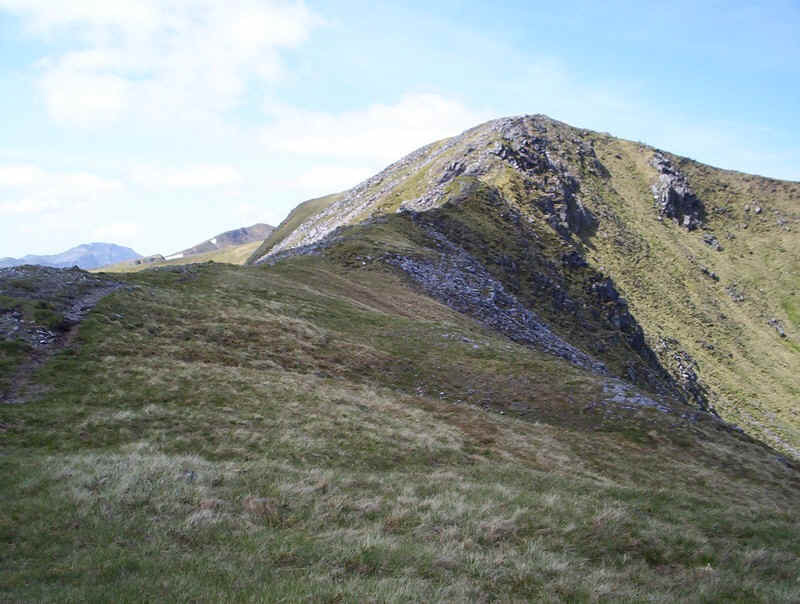 Aonach air Chrith's summit cairn (1021m) appears to be overlooking a big drop....... 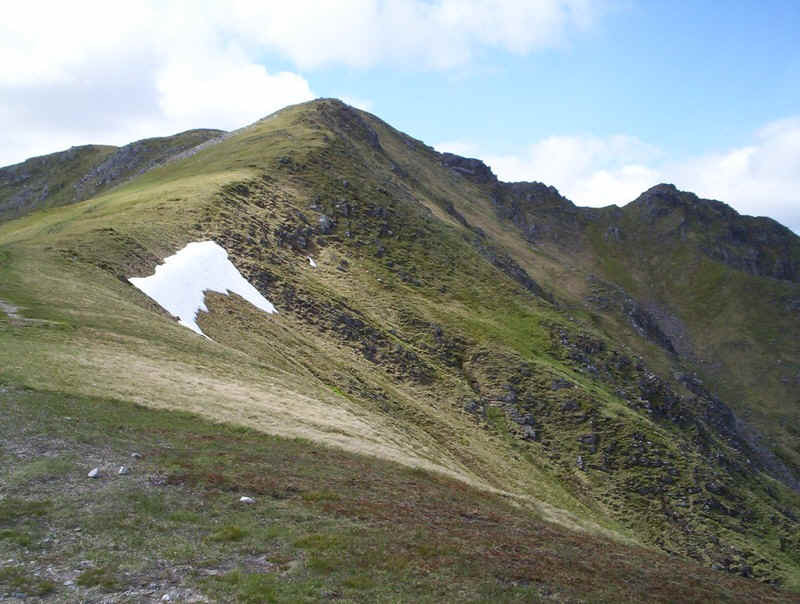 According to my guide book I should have taken 80 minutes from Creag a' Mhaim but what with taking dozens of photos, stopping for drinks and chatting to another walker, as well as taking that narrow section of the ridge very slowly I'm afraid I'd taken well over two hours. 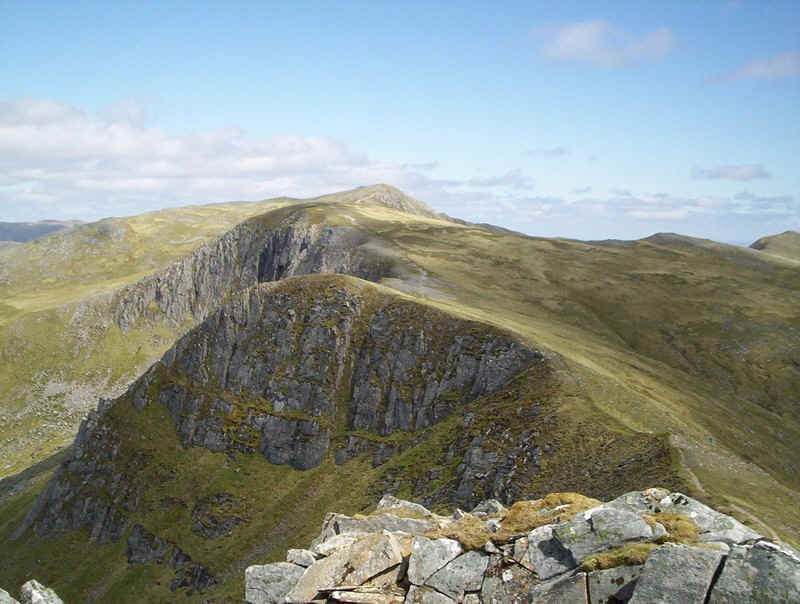 But of course, that's precisely why I'd split the ridge walk in two; why rush with views like these. I have to admit that a few years ago this section would have really "freaked me out" with its narrow crest and steep drops on both sides. However, with no wind and dry conditions under foot I have to admit that I began to enjoy it, so much so that I kept stopping and taking photos. ......and I breath a sigh of relief! 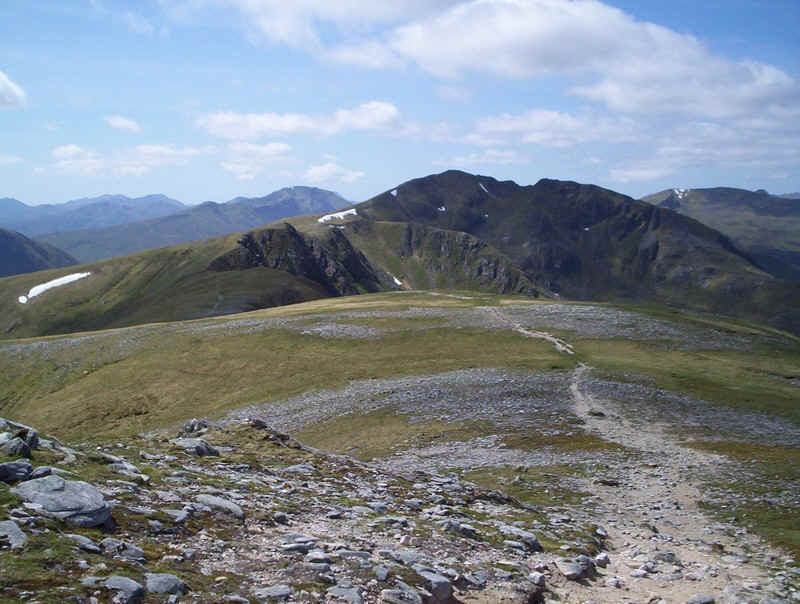 Onwards to the last Munro of the day Maol Chinn-dearg. 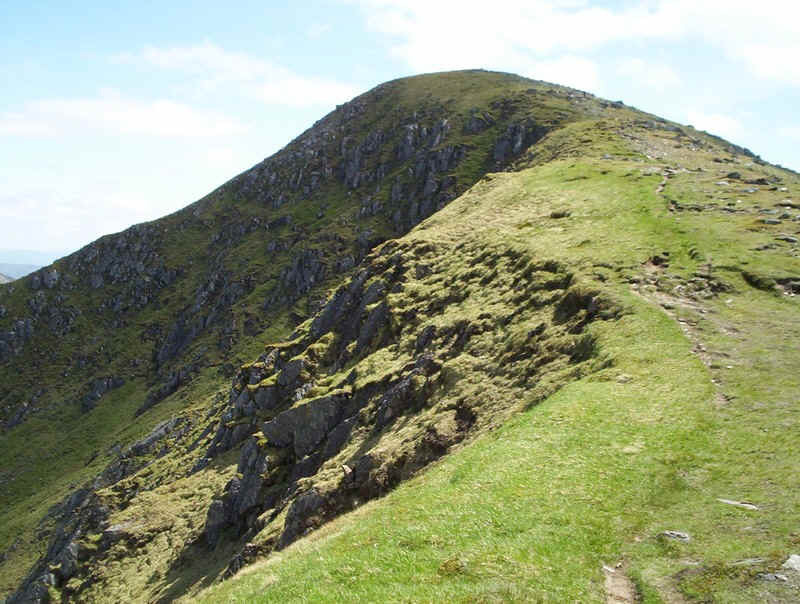 Seeing the near sheer face of the ridge from below does give some idea of why a slip isn't a good idea.. 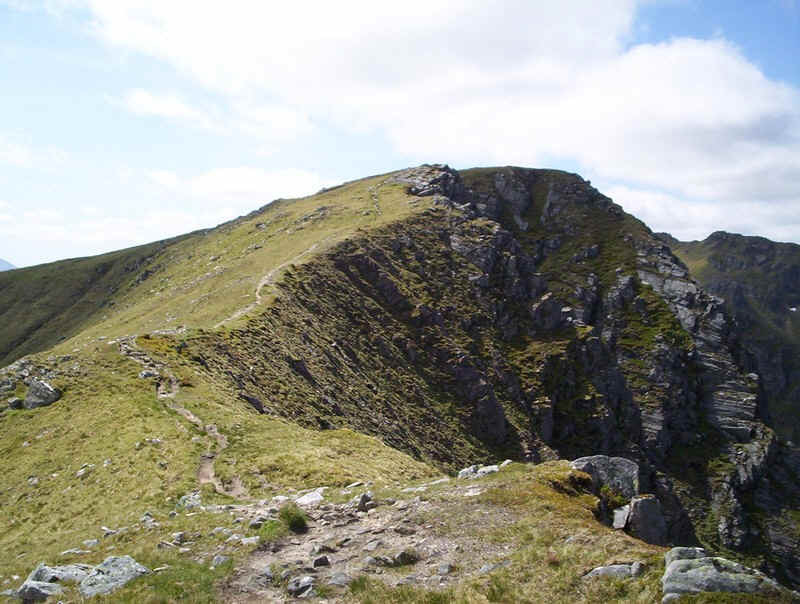 Beyond the end of the ridge the path surmounts yet another rise at the head of the Druim Coire Droma Beag. 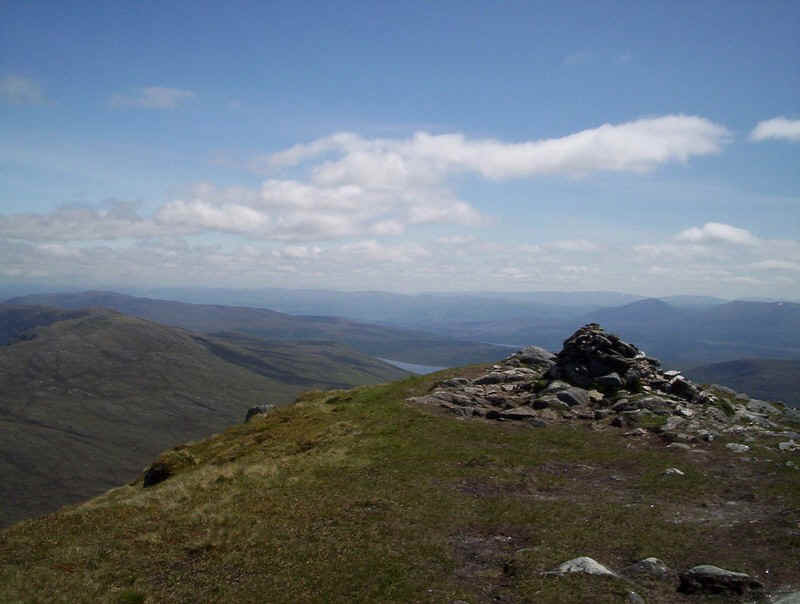 From a low point at 892m the final climb is to Maol Chinn-dearg summit. 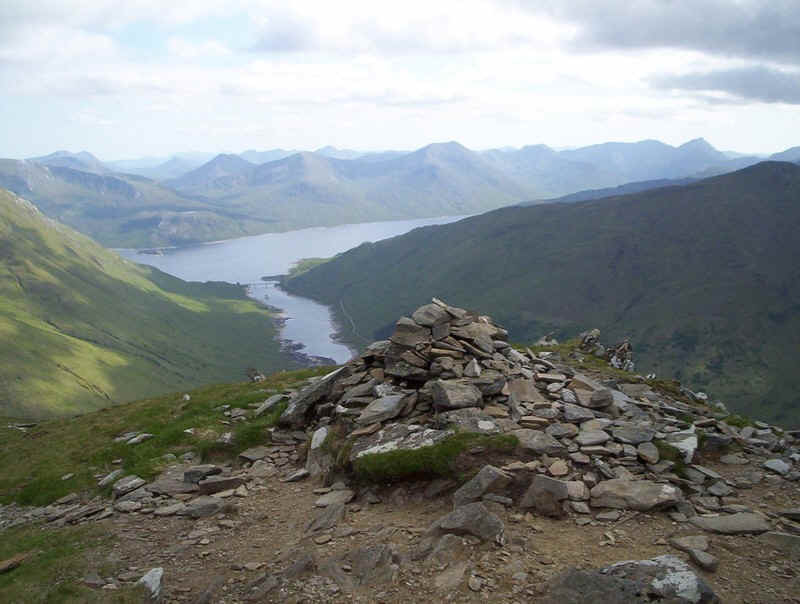 The reward is this marvellous view from the summit looking down to Loch Quoich. Once again my timings were completely at variance with my guidebook. 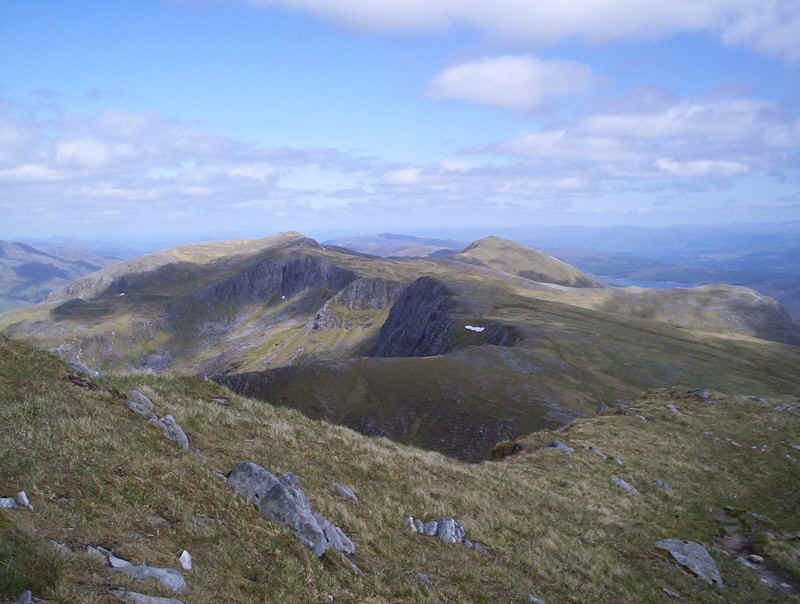 It had taken me an hour and a half from Aonach air Chrith to Maol Chinn-dearg, instead of the suggested 45 minutes! ......of the way west. 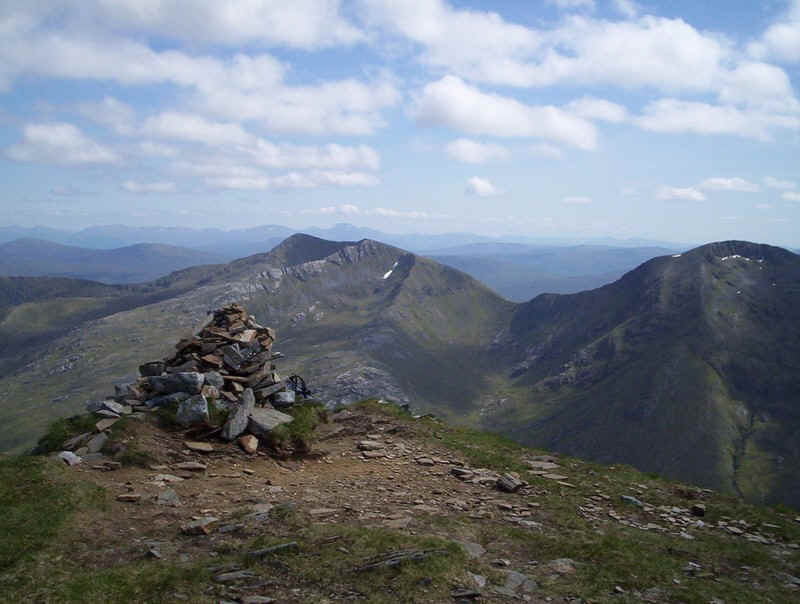 I'd be walking back to Maol Chinn-dearg from the west tomorrow if all went to plan. 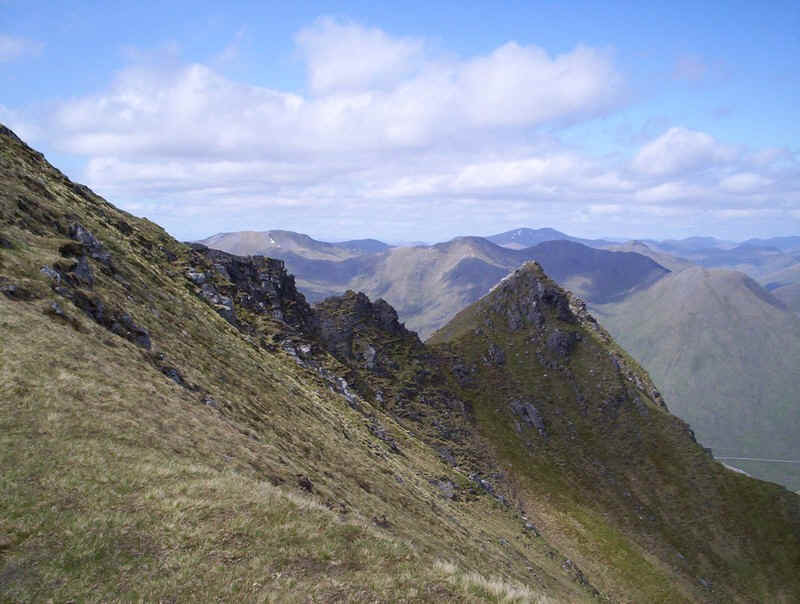 In the distance is the summit of Sgurr an Doire Leathain. As usual it's a long way down to the road but there's a good path the entire way from the summit. 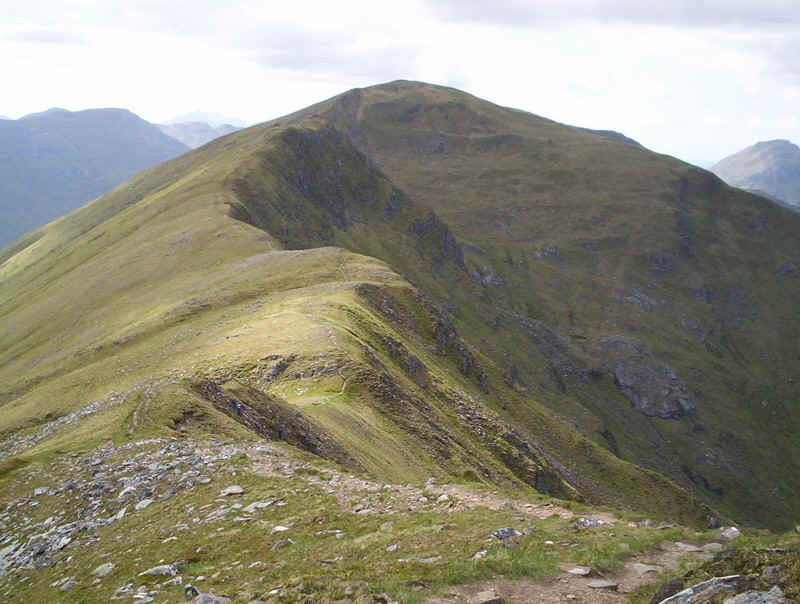 There's absolutely no doubt where you're heading on this ridge. 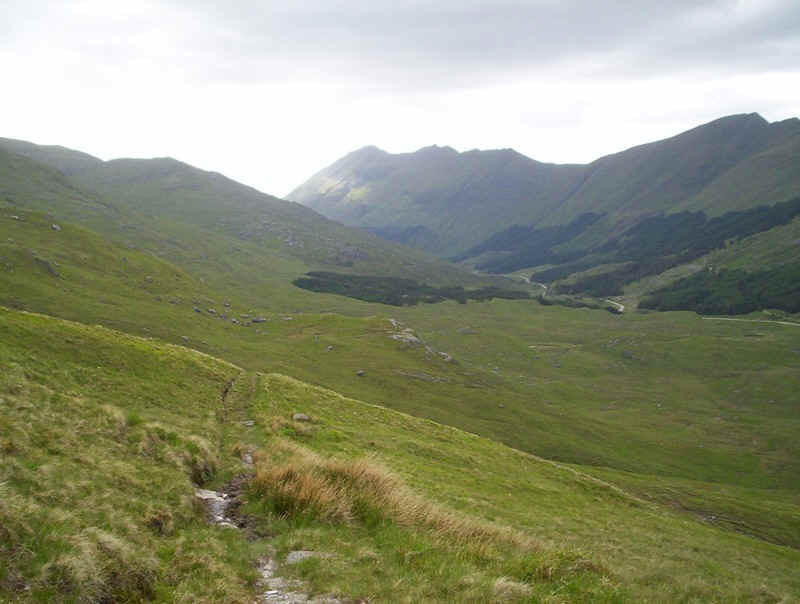 Eventually the walkers' path turns into a superb stalkers' track that descends in great loops down into the glen. There are a couple of streams to cross before the A87 is reached. 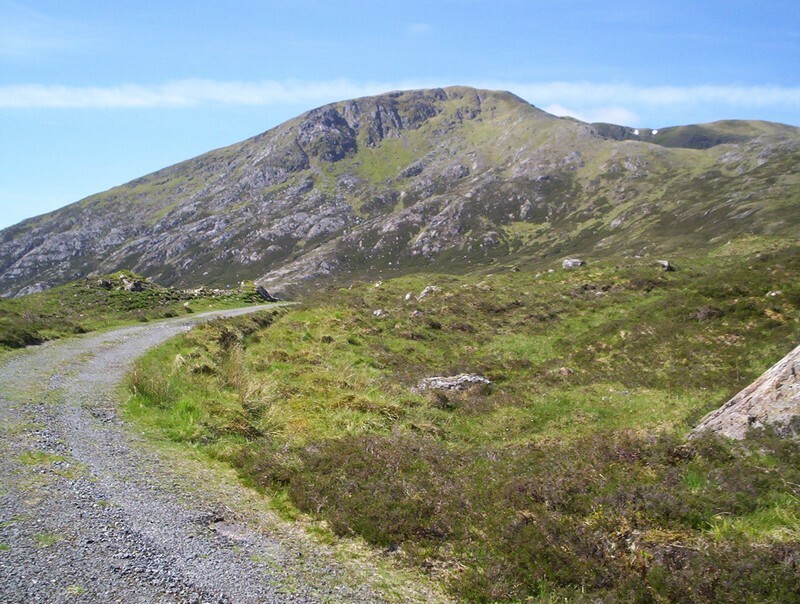 It's about 4km along the verges of the road back to the Cluanie Inn.